Toffey is our 35 year young mare. She has coped with Cushing’s for the last 5 years. If given a chance she runs and bucks and plays with the young guns. While it can be difficult to keep on top or routine foot care, neglecting your older horse’s feet can lead to a number of problems, including white line disease and abscesses. Early dental abnormalities left unattended can deteriorate into huge problems, such as the severe molar wave, along with worn-out and lost teeth, which you can see in this x-ray. More horses are living well beyond the magic age of 20 these days. There are many reasons, but the most likely is that we just let them live longer, because our value systems have changed and we have a sense that these beloved horses have become endeared to us just like dogs and cats.Our knowledge of equine veterinary medicine, along with nutrition, podiatry and dental care, has also developed in leaps and bounds in recent years. Just like you and me, horses’ age at different rates and the care we give them needs to be targeted to their specific needs. This combination allows us to help you design and implement a tailored program of health care for your equine companion. Call the clinic today, on 08 8523 4777, to discuss pricing and options to become part of the program. Read on below to learn more on what conditions commonly affect our older equine companions. The older horse that is not showing or being used much should be allowed to grow out a protective longer coat. That is not to say they should be sporting shoulder length curls as do some Cushing’s horses (more on that later), but clipping a horse in winter then applying the four rugs he/she wore during their show career is not a smart choice. Should your horse be rugged? Well that is the owner and the horse’s preference. A good clue to your horse’s preference might be having them continually tearing them off. We kind of think that might be a personal statement. If you are using a rug, make sure the coat underneath is examined regularly for rubbing and dermatitis. Rain rot (or Dermatophilosis) is a bacterial disease which likes wet horse’s backs. It is usually where the saddle fits and it can be painful in some cases. It is usually easy to cure by using any medicated shampoo. Ringworm is a term used to describe a fungal condition that is common in younger and older horses whose immune system might be compromised. Again, you can treat this but you need to use a medicated shampoo that has an anti-fungal ingredient. In some cases it can be extremely itchy. We like Triocil, but if your horse is itchy we may need to help you out with further medication. Rugs that aren’t maintained properly can be hazardous. We have gone out on numerous occasions to older horses who got stuck in a strap, or who got their rug over their head, and after exhausting themselves trying to scare their paddock mate in a game of hide-and-seek, have gone down and been unable to get up without help. Often the older horse’s feet get neglected. All the younger horses get trimmed, but the older ones might be on an ‘every other’ trip schedule with the farrier. 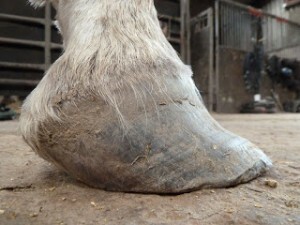 Long overgrown feet cause dirt to trap in the white line and the bars and this often leads to hoof abscessation. Again, with the older horse’s immunity being low, this can be slower to resolve. 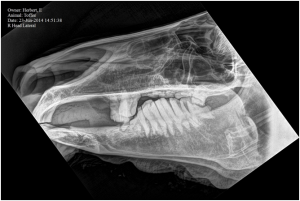 Older horses are much more prone to have small imperfections in the dental arcade and these can become major factors as they age. Prevention when they are younger is the best way to minimize these, but once they are there they need frequent attention. Older dental problems can result in quidding or spitting out partially chewed food. In advanced cases in the upper arcade, an infection from a tooth can migrate into the sinus. This presents with a horse with a one-sided snotty nose. The smell is a good clue it is from a tooth. If it cleans out your nasal hairs then it is a good idea to call for professional help. These are no longer the huge problem that you might think. They are important, but these days scientific management is considered best practice. We like to do both a faecal flotation and a faecal egg count. The egg count doesn’t pick up tapeworms, and they do need to be considered. Horses do develop some immunity over time and again some older horses do lose their immunity, and are more prone to parasites, than middle aged horses. We can perform a test on manure to help you develop a plan for parasite control. We get lots of questions about dewormers, and even if you want to purchase your dewormer from the fodder store, we suggest that you let us help you decide which dewormer to purchase. Cushing’s disease, or syndrome, is generally seen in older horses. The cause is a growth or hypertrophy of the pituitary gland in the brain. The pituitary gland then releases lots of hormones that affect the metabolism of the horse. It is a common ‘ailment’ of the aging horse. While not all horses get it, it is seen more and more due to the increase in the aging population. The slam dunk diagnosis is a non-shedding, long haired horse or pony. In the early stages the winter coat may just be a bit longer than last year, and the horse may still shed, but over the years the hair gets longer and sheds less. The hair coat can range from mildly longer to extraordinary. The long hair can be an advantage in the winter, but can also be a little too insulating in summer and may require clipping. 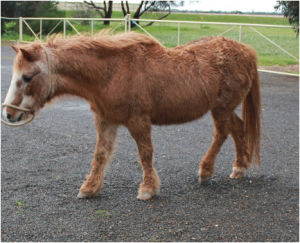 The other symptoms that are associated with this syndrome can be excessive drinking, laminitis, frequent skin infections, sway back with a pendulous abdomen and dental problems. In recent years the use of Pergolide has helped dramatically to reduce the secretion of hormones from the pituitary gland and correct many of the problems seen in the affected horse. Pergolide is given daily as an oral supplement and is usually well tolerated. Not all Cushing’s horses are treated. If the only symptom is a long hair coat, then sometimes careful observation for the other more problematic signs is all that is needed. The gold standard in diagnosis is measuring a hormone called ACTH. It has been an expensive and difficult hormone to measure in the past, but local testing at a reasonable price is now available. This is a common problem in older horses. The main culprits include dental issues, sand accumulation and malabsorption issues. Older horses have more problems with digestion and absorption. Through the test of time their intestine don’t move as readily and damage to the lining prevents efficient absorption of protein, minerals and especially carbohydrates. What kept him or her fat before, just doesn’t anymore. This needs to be addressed and a basic physical and dental exam and blood tests are in order. Horses in our area that have had 25-30 years exposure to toxic plants, such as Salvation Jane, can take their toll. Both the liver and kidneys need to be considered. In severe weight loss there can be a significant increase in muscle damage, which can also be assessed through laboratory analysis. Feeding suggestions include good quality hay, and a good supplement that gives the needed minerals and vitamins. There are now a few senior feeds available. Some have higher fat content and are easily eaten and broken down, even with missing teeth. Hence strategies to increase weight or maintain weight include; increasing the quality and quantity of hay, and using high quality chaff for horses that can’t chew properly. Horses need long stem fibre to make the colon work properly, so provide some regular hay for those on chaff. Our favourite is oil. You don’t need to buy fancy oil. We recommend an inexpensive vegetable oil. Paraffin oil won’t work, and linseed oil in large quantities can be toxic. We buy oil in 20L containers from a fish and chip supplier. Start with a small amount to make sure your horse isn’t one of the ~5% that won’t eat it. A regular horse can have up to a cup morning and night. We recommend starting with a quarter of a cup and working up to a full cup. The odd horse may take even more. Ponies can usually take a half of a cup and mini’s a quarter of a cup twice daily. Just like you, older horses get arthritis. We see several horses a year that really struggle to get around, get up and down, and even get their heads down to eat due to arthritis of the joints, including the spinal column. We can’t reverse the aging process, and the ensuing arthritis, but we can help alleviate the pain. Anti-inflammatories such as phenylbutazone (bute) is the mainstay of our pain control. It can have long term, and even short term in some horses, side effects but by and large it is not the big-bad-boogieman that it is reported to be. Most horses tolerate it quite well and for very extended periods of time. If you want something a bit more reparative then Pentosan may be your ticket. It is a joint product that is used in performance horses and can provide joint relief, and is also somewhat reparative to joint structures. In many cases this eliminates the daily use of pain medicines. There are other products that have anti-inflammatory action. Rosehip has good reports in the literature for arthritis. The best thing to do if you are unsure about a product is to ask us. We are happy to look up products for your information. Just because Google says it is good, doesn’t mean it really is. Medications such as Pentosan have the best effects when treating early, rather than advanced, disease and hence early detection of joint pain or unsoundness is important for ongoing management.